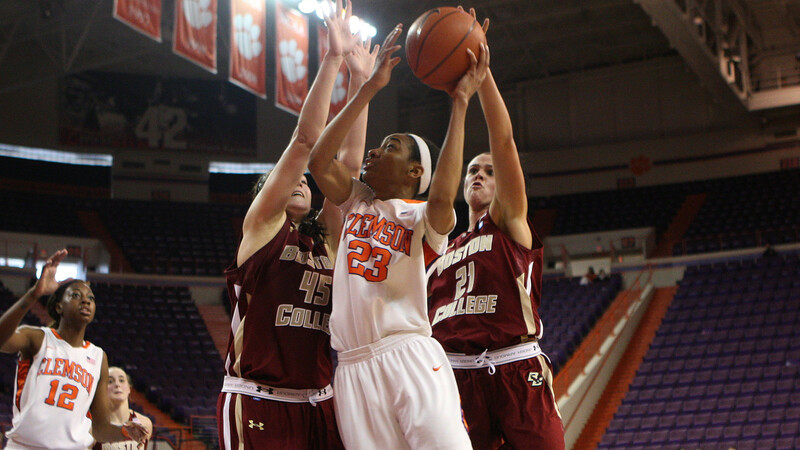 CLEMSON, SC – The Clemson women’s basketball team fell to Boston College 66-43 on Sunday in Littlejohn Coliseum. Clemson (4-12, 0-5 ACC) fell to 2-7 against the Eagles (8-7, 2-2 ACC) all-time. Chancie Dunn led Clemson with 11 points, and also added five rebounds in 31 minutes. Quinyotta Pettaway had 10 points and 11 rebounds for her fifth double-double of the season. She has tallied double-figures in rebounds in six games this season and in scoring eight of the last nine games overall. The Eagles outscored Clemson, 30-26 in the second half, but it was a potent first half that gave BC the ability to claim a double-digit lead, and not look back. Kristen Doherty and Katie Zenevitch had 18 points apiece for the Eagles, who had a 19-15 assist-turnover ratio in the game. Clemson outscored BC off the bench, 16-12, behind Dunn’s 11, and five points from Kelly Gramlich. Charmaine Tay played a career-high 39 minutes, and added two blocks in the game. The Eagles held Clemson’s leading scorer, Nikki Dixon, to just seven points, as she went to the bench early with foul trouble. Dixon did add a career-high four blocks, but had her streak of eleven straight games in double-figures snapped. She entered the game averaging 17.3 points per game in ACC play. Clemson scored the first bucket of the game when Turner knocked down a jumper from Tay, but BC scored ten straight over the next six minutes before Pettaway had a putback to draw within 10-4. Boston College stretched the lead to 20-8, before Clemson responded with seven straight, including five from Dunn to pull within five at 20-15 with 7:03 to play, prompting a BC timeout. Out of the timeout, BC scored 12 consecutive points, and held the Tigers to just two for the rest of the half in going into the break ahead, 36-17. The Eagles outrebounded Clemson, 27-17, and scored 11 points off 11 Clemson turnovers. Each team did have five blocks in the half, led by two apiece from Dixon and Tay for the Tigers. BC hit five of their 15 three-point attempts. Boston College stretched the lead to 50-25 with 11:29 to play, but Clemson responded with an 11-2 run, prompting a BC timeout. Clemson would get no closer than 16 the rest of the way. Clemson will return to action against Wake Forest on Thursday. They’ll travel to Winston-Salem, NC for a 6:30 pm game at Lawrence Joel Veterans Memorial Coliseum.